and before flying to our next destination. guests including a little girl's tea birthday party. The girls were dressed up and used their best tea manners. Piano music accompanied tea time. Floor to ceiling windows look out on the pretty garden courtyard. Our server greeted us and poured hot water over Flowering Tea n a glass. Are you familiar with Flowering or Blooming Teas? They are tea leaves sewn around flowers. When steeped in hot water, they slowly blossom. The tea selection included White, Green, Oolong and Black Teas. Caffeine free herbals and hot chocolate were available. and Glenn chose the Decaf Acai Pomegranate Black. The pretty Tunisia China was designed for the hotel. Blair was our knowledgeable and friendly server. He refilled our teapots with hot water several times. The tea service began with Strawberries and Creme Chantilly. Strawberry Jam, and Lemon Cream for each guest. Ham and Cheese Salad, Egg Salad, and a Salmon Wrap. were brought on another three-tier server. La Bonne Vie pastry chef. The guys said the pastries were delicious, and didn't care for the jellies. I was served a lovely plate of fresh fruit since I am gluten free. 1:00 - 3:30 with reservations. The Grand America Hotel in 2004. What a fabulous tea, and I LOVED seeing the photo from 2004! My, what a difference a mere 9 years makes. Your son is growing up to be a fine young man. It's wonderful he enjoys tea with you. You are so fortunate to have such lovely tea experiences and so thoughtful to share them with us. Madeleines and jellies and Linzer cookies, Oh, My! What a festive, dainty repast, in such a setting, and in such congenial company! We've not traveled since mid-May, and now I feel as if I've been on a wonderful guided tour to SUCH interesting, unfamiliar places. All the scenes and adventures, with welcome stops for such inviting refreshments---I think I've signed on for a Lifetime Ticket on the Friendship Train. 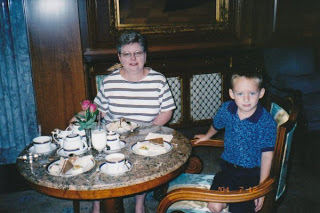 Such a delightful tea, and right off I noticed how your son is older in the photos since I started viewing your blog. Nice to have the 2004 photo as well. The jellies sound interesting! And I loved seeing the 2004 photo! I know I would like the jellies. How fun to see you having tea here on two different occasions. Austin has surely had his tea experiences.